What is nettle? Stinging nettle (1), or nettle leaf, is a large, perennial plant that grows tall and wild. It’s also safe for human consumption and has been used for hundreds of years. When touched, the plant can cause hives and prick the skin because of its sharp leaves which break off easily, hence the “stinging” in its name. But while this plant can act as an irritant, it’s also a calming balm for many ailments, including but not limited to arthritic pain, diabetes, malfunctioning kidneys, and the common cold. Nettle tea can benefit the body in so many surprising ways! Nettle leaf acts as a calming balm for many ailments, including arthritic pain, diabetes, and malfunctioning kidneys. There are about 35 species of flowering plants in the genus Urtica, of which stinging nettle (Urtica dioica) is one. It’s native to Europe, Asia, north Africa, and western North America. Legend has it that the Tibetan saint, yogi, and poet Milarepa (born c.1052 CE) lived on nothing but nettles for the decades he spent in complete meditation. In medieval Europe, the nettle leaf was used as a diuretic to rid the body of extra water and to treat joint pain. Today, we understand how versatile this prickly leaf is and how it can contribute to your health when consumed. Nettle leaf benefits include regulating blood pressure levels and can even aiding in weight loss. Nettle leaf tea isn’t technically a tea since it isn’t made with black or green tea leaves. Nettle leaf tea is typically made from its dried leaves, not the roots. Leaves can be purchased from a health food store or anywhere that sells natural remedies. Look for a good quality product; something that is 100% pure. To make the tea, boil water. Add about a tablespoon of dried leaves to a teapot with a strainer if possible. Pour the hot water over the leaves, and cover the teapot. Allow to steep for 15 to 20 minutes. 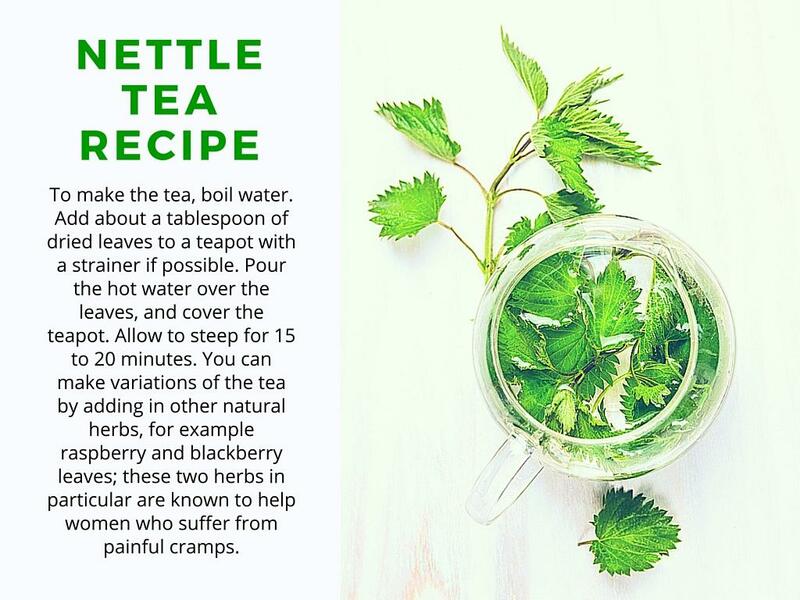 You can make variations of the tea by adding in other natural herbs, for example raspberry and blackberry leaves; these two herbs in particular are known to help women who suffer from painful cramps. If you prefer your tea cold (or if it’s a particularly hot day), make the tea in a large batch and chill it. Just be sure to label it or let young ones know not to drink it without your supervision—though if you decide to let them take nettle, this should first be discussed with your family doctor. There are so many benefits to stinging nettle that it’s a wonder more people aren’t drinking this tea. It can relieve menstrual cramps and bloating, reduce skin issues, alleviate diarrhea, destroy intestinal worms and parasites, reduce symptoms of a cold, and relieve the symptoms associated with menopause. Stinging nettle is also loaded with vitamins A, C, D and K, and is rich in vitamin B. It’s a good source of iron, potassium, manganese, calcium, magnesium, phosphorous, silica, iodine, silicon, sodium, and sulfur. 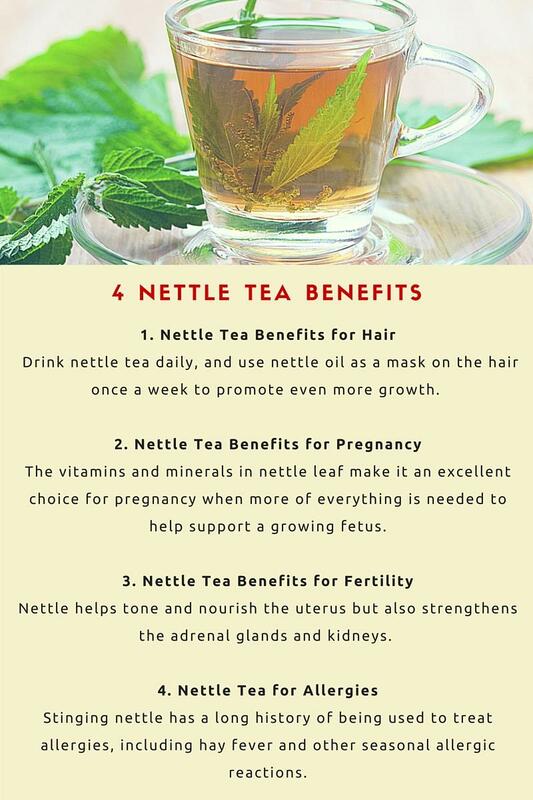 Below are four more nettle leaf tea benefits. If hair loss is an issue, nettle can help out. It’s been used as an aid to promote hair growth for hundreds of years. Drink the tea daily, and use nettle oil as a mask on the hair once a week to promote even more growth. Nettle can also help control dandruff. Many herbal teas blended exclusively for pregnant women have nettle in the mix. The vitamins and minerals in the leaf make it an excellent choice for pregnancy when more of everything is needed to help support a growing fetus. But be careful to not drink too much in the first trimester because it can stimulate uterine contractions; it’s safe to consume in the second and third trimesters. Be sure to use the leaves, not the root. Fertility struggles plague many women, especially those trying to conceive over 40. Fertility treatments and drugs can help, but there are natural alternatives as well and nettle is one of the best ones. Nettle helps tone and nourish the uterus but also strengthens the adrenal glands and kidneys. Drink one to three cups a day in the months ahead of conception to help prepare and strengthen your body. Stinging nettle has a long history of being used to treat allergies, including hay fever and other seasonal allergic reactions. The best way to prevent seasonal allergies is to drink two cups a day two months ahead of the allergy season that bothers you the most, to help build up immunity. A double-blind study published in the journal Planta Medica in 1990 (2) reported that 58% of test subjects reported stinging nettle to be an effective remedy for their allergies. Just because herbs have been used for hundreds or even thousands of years doesn’t mean that there won’t be complications from taking them. There are quite a few side effects and precautions to keep in mind when it comes to stinging nettle, but that shouldn’t scare you off. Just be aware of them, and if you think it might problematic for you, speak with your doctor about the benefits of nettle tea for your health. In fact, before starting any new herb, you should discuss its use with your doctor. Hives or rash (mostly from topical use, not tea or capsules). Stinging nettle can have a diuretic effect on some people, so if you have kidney or bladder issues, talk to your doctor before you start taking it. 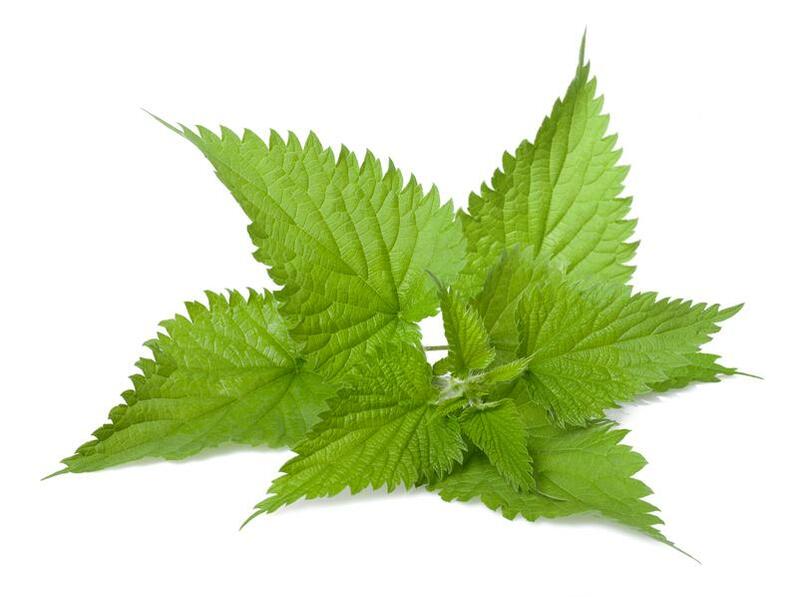 Don’t apply stinging nettle to an open wound unless the formulation says it’s OK to do so. Stinging nettle can irritate the skin, so take some precautions and read the labels for proper usage. Research suggests that nettle could possibly raise blood sugar and interfere with diabetes management. Conversely, research also shows that it can lower blood sugar. If you have diabetes and you want to use stinging nettle, be sure to monitor your blood sugar level closely. 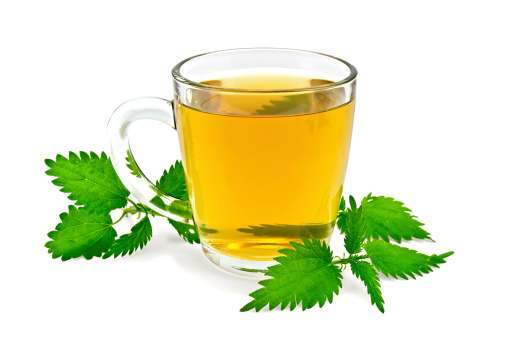 If you develop a nettle tea allergy, stop drinking it immediately and seek medical attention promptly, especially if hives suddenly appear, you have trouble breathing, and/or your face swells up. Nettle tea benefits are numerous and if you can tolerate it (i.e., without it interfering with medications or your blood sugar), then you can consider making it a regular part of your medicine cabinet to treat a slew of ailments. Using something natural is a great first step toward treating health problems, but always seek medical advice if an issue is worsening.